Lorraine Abrams lives at the beck and call of five funny felines. She encourages Spicy to keep up her letter writing and poetry as a way to remember the fun times in her life, and occasionally she helps Spicy with her typing when her little paws get tired. 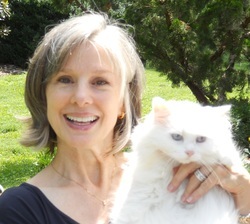 Lorraine and her husband, Alan, enjoy residing with their cats in Nashville, Tennessee. You can find Lorraine's books on Amazon.com. Spicy's first book shares moments of her life with her pen pal, Rainey. Through letters, she tells stories of herself and her companion cats. These stories include her scary experience the first time she almost had her claws clipped, why she wears a special collar to keep her in the back yard, games she has invented, and whether it's okay to be a scaredy cat. In Spicy's second book, she continues to keep her pen pal Rainey entertained with stories and poems about her feline housemates. She uses poetry to describe a fun visit she had with her human friend Lyla, who loves cats, and when they all hid, except Spicy of course, Lyla and Mother went looking for them. She also shares memories of her Auntie Kiki, a beautiful Siamese, games she plays, Tinker's career (can you believe that?) and the time she wanted a pet of her own.